Includes: Mower Boss Platform, 3-piece spray boom (38″ wide), 15-Gal Deluxe Sprayer w/ Hand Wand, 2 Nylon tie-down straps, 2 spray tips, hose clamps, 3/8″ hose and all adapters to connect to the tank. “Ready-to-Spray”! If your mower has a flat, vertical hitch with a flat surface of at least 10.5″ x 6″ then you can attach the Mower Boss out of the box. The support arms are attached by drilling 4 holes in the hitch of your mower. 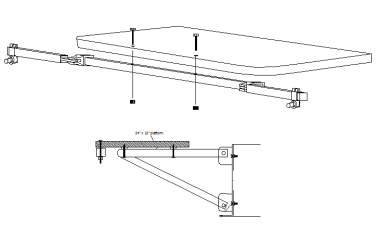 Otherwise, the Mower Boss is easily attachable by using a 12×8 piece of sheet metal. If you are able to firmly attach the 12×8 piece of sheet metal to the back of your mower you can then attach the platform to it. The electric sprayer and spray boom allow for faster and more uniform coverage for larger lawns. Surface-mount sprayers are easier to maneuver in tight places compared to pull-behind sprayers. The 12-V pump is operated by the riding mower’s battery and the on/off switch can be held in your hand during application so you have a convenient switch that controls the flow of your chemicals. Surface-mount sprayer attached to the Mower Boss allow for easier application of chemicals than pull-behind type. Since the spray tank is attached to your mower you don’t have to worry about the tow-path as you would if you were using a pull-behind style. The tank is secured to the Mower Boss platform with two heavy-duty nylon straps (included in the kit). 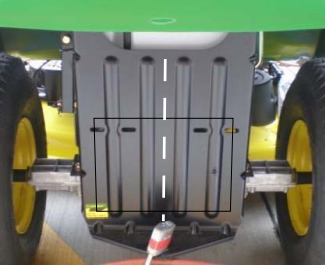 The Mower Boss platform (once installed on your mower) rides about 18″ above the ground surface making it ideal ride-height for the spray boom. Being close to the ground minimizes chemical drift. Putting the chemical exactly where you want it is the name of the game, regardless of what you’re spraying. This minimizes costs, since you can spray more efficiently, and it makes for a healthier environment. Breathing pesticides or herbicides is, of course, not recommended – so get that stuff on the ground and not in the air! The 3-piece spray boom is constructed of aircraft-grade aluminum for rust and worry-free use. The spray boom ends can collapse in case you accidentally strike an object or if you simply want to make the boom more compact for storage. This is our most popular item here at MowerBoss! The spray boom attaches to the Mower Boss platform with two thumb nuts for easy and quick removal. If you are looking for a sprayer for a lawn mower, this is one of the few options that doesn’t involve some type of cumbersome tow-behind attachment. 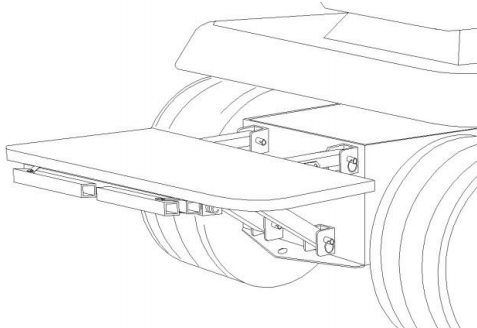 Like the other attachments we design to be used with the Mowerboss universal platform, the sprayer kit can be installed, used, then pulled right back off. After all, isn’t this really the perfect use of your riding lawn mower? Why just use it to cut grass? Put it to work and minimize your hassle. Note: Ride on mower spray booms sold by MowerBoss are fold-in, meaning they fold in on themselves to minimize the chance they will catch on obstacles when not in use. Many of our customers purchase sprayers that work with both our spray boom (for wide area treatments) as well as with hand wands, for more focused treatment. In many cases, you can save money by buying your chemicals in concentrated bulk packages, then using the large sprayer tank to mix them. In some cases, doing so can cut the cost of the treatment nearly in half.